Save a few bucks and look for deals and special offers on water and Lake activities. Tahoe boasts over 300 days of sunshine so chances are you'll be on the water at some point. There are deals to be had so just look for them and keep checking back for updates. Tributary Water Tours: With 30 years in the business, Tributary Water Tours knows the waters and knows the sport of water rafting. You can put your life into their hands and have the outdoor aquatic adventure of your dreams. Pump up the adrenaline rush and head down the river with these Lake Tahoe water rafting experts. The cool thing is that you can pick from over 12 different rivers, and outings that last for half a day or even up to 5 days with camping. Find solid and appealing Lake Tahoe tour promos with them. Tahoe Whitewater Tours: Make waves or at least go rafting right through them when you score yourself Lake Tahoe tour promos through Tahoe Whitewater Tours. The water is calling all daring vacationers who wish to do something a little out of the box. If you love to feel the adrenaline increase and enjoy being outdoors and on the water, Tahoe Whitewater Tours is perfect for you. 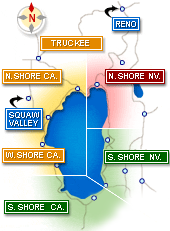 Get great Lake Tahoe tour promotions at Tahoe Whitewater Tours. The smaller 6-man boats give you and yours an improved, personalized rafting experience. Lake Tahoe tour promos are basically sweet money-saving gifts. Stay active and enjoy the various land activities you can partake in while you're in Lake Tahoe. Lake Tahoe Snowmobile Tours: Zoom your way to and fro and anywhere you want to go with Lake Tahoe Snowmobile Tours. Check out the tour promos in Lake Tahoe available with this fun company. It's all about showing the mountain who's boss when you're in command of a snowmobile. Why ski or snowboard when you can rock what is essentially the motorcycle of the snow? There are several tours from which to choose, and you'll find your perfect one based on the number of riders in your group and your desired tour duration. Wanna Ride Tahoe Bike Shuttle and Tours: Personalize your bike tour in Lake Tahoe. With Wanna Ride Tahoe Bike Shuttle and Tours, you can slice off a chunk of your vacation recreation expenses with Lake Tahoe tour promos here. The custom trail maps outline various options for your route. It helps to plan your bike route based on your fitness level and experience. Enjoy a fitness activity that is engaging and exciting for the whole family. Peruse this nifty list of Lake Tahoe Tour Discounts to help you save on fun things to do in Lake Tahoe. Why pay full price when you can save a load with Lake Tahoe coupons? If you're interested in cutting vacation costs, these Lake Tahoe deals allow you to pay less than the regular price. Being a savvy consumer means being in-the-know about useful tour discounts in Lake Tahoe. You want to see as much as possible while you're on vacation here - and you can stretch your dollar farther with the use of these coupons and deals for Lake Tahoe tours. Lake Tahoe hotel deals allow you to save money on your lodging expenses. It's nice to be able to shave off costs from as many aspects of your vacation as possible. You can easily get a comfortable place to stay that makes it convenient for you to get to Lake Tahoe tours. Affordable, ideally located and chock full of comforting amenities, Lake Tahoe accommodations will set themselves in your mind as the ultimate homes away from home. If you're going to be traveling with many friends and family members, it can help to look at Lake Tahoe accommodations for large groups. These work great if you're in Tahoe for a wedding celebration, family reunion or other festive occasion. One of the most popular things to do in Tahoe is to hit the slopes in the winter, and Tahoe's Best can help you find all the best Tahoe ski deals, Lake Tahoe lift ticket deals and vacation and ski packages that will make your winter vacation much more enjoyable, and much more relaxing when you're not worrying about the costs the whole time! Enjoy your Lake Tahoe vacation for less when you're finding the best ski deals, hotel deals, vacation packages and more! When you're on vacation here, you want to see the sights and enjoy the activities. Lake Tahoe discounts make it that much easier on your bank account by giving you more for your money. Instead of only being able to see a few parts of Tahoe, you can expand the reach of your travels. These affordable Lake Tahoe tours make for absolutely unforgettable vacation experiences. The memories you will share with your friends and family revolve around the things you do together. Lake Tahoe tours are going to be on that list of memory-making activities. It's helpful to save money on your accommodations with Lake Tahoe hotel deals. You can easily go to Lake Tahoe and have the enjoyable vacation you want on a budget. By using the resources on the South Lake Tahoe hotel specials page, you can score a room on the South Shore at a totally beautiful price. Eating well for less is made easy with restaurant deals and promotions in Lake Tahoe. Enjoy a wealth of culinary delights on your trip. Eating like they do on food TV shows may well be your status quo in Tahoe. If you're visiting Lake Tahoe in the winter, be sure to check out all the Lake Tahoe ski deals that can save you big on your stay at a fancy ski resort, get you discounts and Lake Tahoe lift ticket deals, Tahoe ski specials and ski packages so that you can do more on this vacation than ever before, all while you're spending much less! Resorts that offer ski packages often offer discounts on lift tickets, rental equipment and deals on other great perks to take advantage of throughout your stay! Use Tahoe's Best to find deals on all the best things to do in Tahoe, whether it's taking a tour, exploring the great outdoors on your own, skiing in the winter or just relaxing in your Lake Tahoe hotel or vacation rental! Don't overpay on your stay!